We are pleased to announce preview availability of SDKs for the Cognitive Serivces - Bing Search APIs. 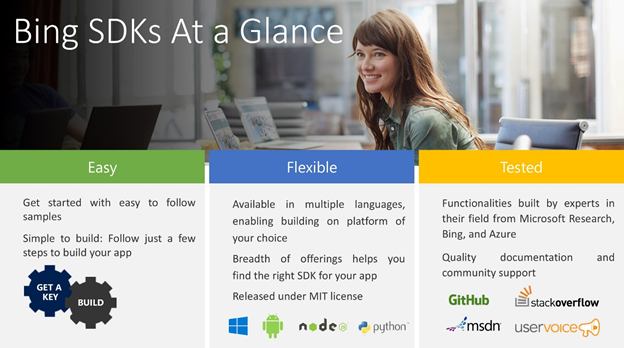 Currently available as REST APIs, the Bing APIs v7 now have SDKs in four languages: C#, Java, Node.js, and Python. These SDKs include offerings such as Bing Web Search, Bing Image Search, Bing Custom Search, Bing News Search, Bing Video Search, Bing Entity Search, and Bing Spell Check. Easy to use and highly flexible in adjusting your basis application scenario. Encompass all the API v7 functionalities, languages, and countries. Reduce assembly footprint through individual SDK for each Bing offering. Enable development in C#, Java, Node.js, and Python. Provide ability to use the new/existing Bing APIs access keys, both free and paid. Well documented through samples and parameter references. Supported through Azure and other developer forums. Opensource under MIT license and available on GitHub for collaboration. For C#, both NuGet packages and SDKs are available for individual Bing offerings. The best place to start is with C# samples. These samples provide an easy to follow step-by-step guide on running various application specific scenarios through corresponding NuGet packages. Each Bing offering has corresponding samples along with a NuGet package that you can use to build your application on top of. For development in other languages, check out Java samples, Node samples, and Python samples. They are all covered under MIT license and include step-by-step guide for you to get started. If you are already utilizing Bing REST APIs in your app, give these SDKs a spin with your existing access keys and let us know how they work in your scenario. If you are just getting started or want to utilize Bing APIs, you can start with free access keys or buy your subscription. As always, we are excited to see what applications you build and how Bing APIs help you do more with your business. For any ideas or suggestions, please reach out to us at User Voice or share your feedback with Azure Support.